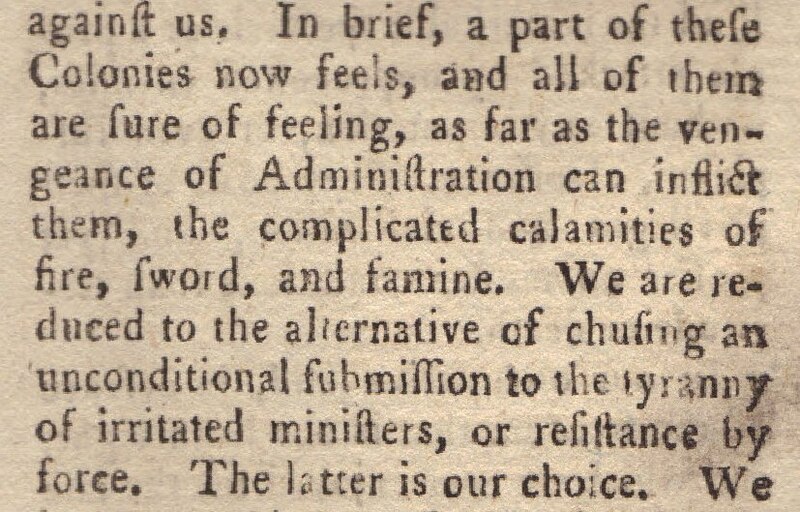 Full Text of the Congressional "Declaration of the Causes and Necessities of taking Up Arms"
This complete August 1775 issue of the Gentleman's Magazine is one of the most historic, with news of Washington's appointment to head the American armies, the formal declaration by Congress that it was taking up arms against Great Britian and the American account of the Battle of Bunker Hill. Below are pictures of some of the highlights of the issue. 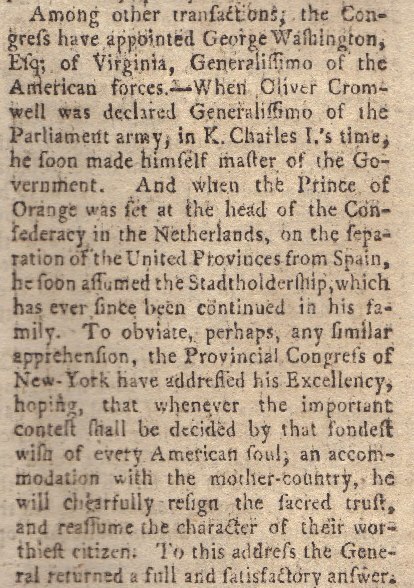 The appointment of George Washington as "Generalissimo of the American forces" is very interesting not only for being the first notice of the appointment that would make Washington the most important person in American in history, but also for the concern expressed over his misuse of the power to rule America and the assurances he gave in this regard, as shown below. Washington in fact modeled himself after Cincinnatus the legendary Roman general who returned to his plow after being granted absolute power to defend Rome against its enemies. 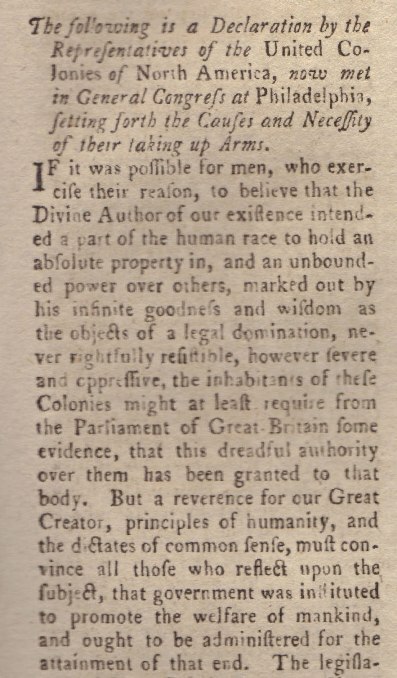 The Continental Congress's "Declaration of the Causes and Necessity of Taking Up Arms" on July 6, 1775 is one of the great documents of American history and much of the language and points made in this declaration, which is provided full text in this issue, were followed in the more famous Declaration of Independence a year later. 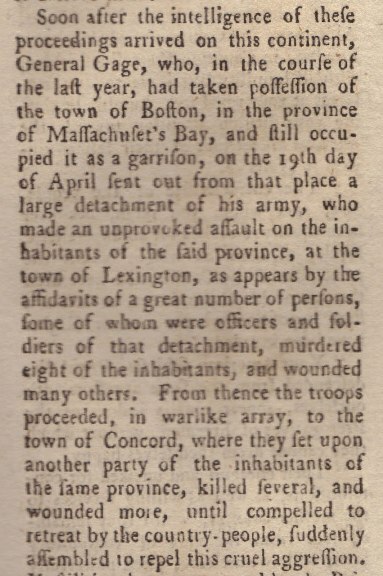 As you can see below, they directly reference the British aggression at Lexington and Concord. 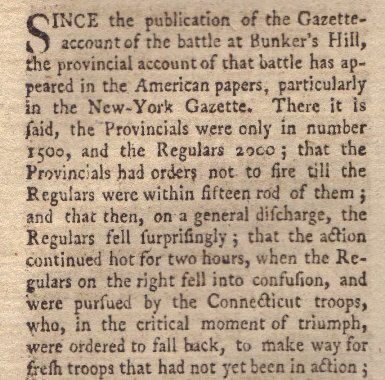 Below are some reports of American accounts of the Battle of Bunker hill followed by other accounts of the battle from people viewing the battle from ships anchored nearby. 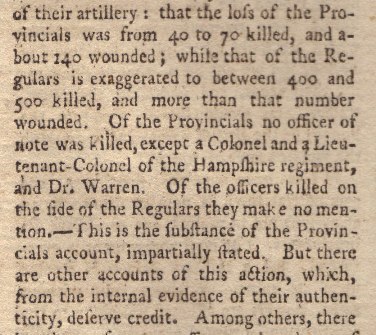 They differ significantly from the earlier British reports, which had the American casualties far more numerous. 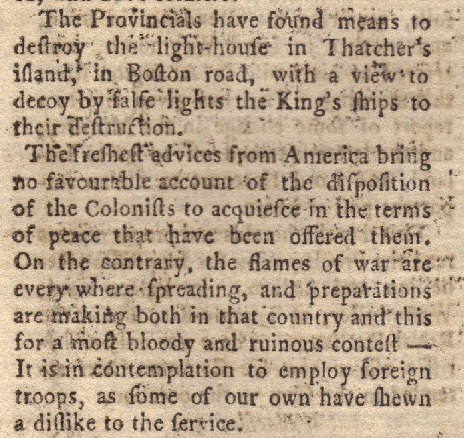 The report below provided the British public information that the important American seizure of Fort Ticonderoga was a planned strategy of the Continental Congress not the "rash attempt of a few private desperadoes" (i.e. Ethan Allen and his Green Mountain Boys and Benedict Arnold). The report and commentary below notes more activity in the Boston area and the unlikely prospects for peace. 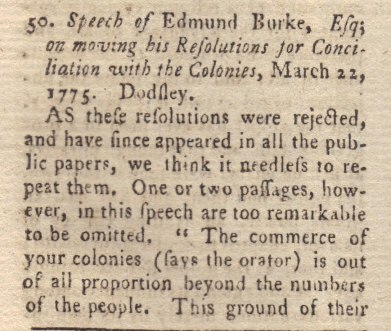 Below are a review of Edmund Burke's pamphlet of his speech proposing reconciliation with the colonies in which he states that the dollar value of the trade with the American colonies before it ceased was equal to the entire dollar value of all British trade less than a hundred years earlier in an effort to show how stupid are the British government policies that threaten the loss of that trade. The issue also includes a complete list of all members of Parliament, showing their positions and the election results in the districts which had elections. 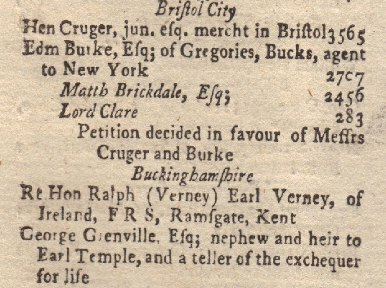 The entry for Bristol, which Burke represented, is shown below. 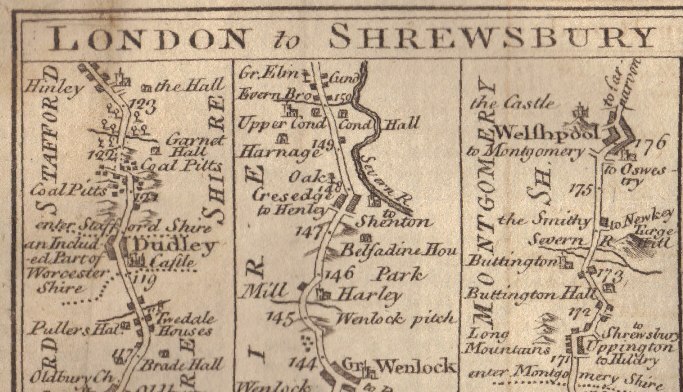 A fold out British road map is included in this volume, which is disbound and complete in all respects. 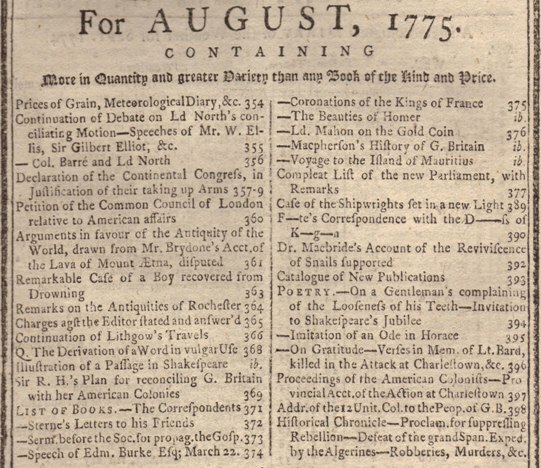 Below is the title page index showing the other subject addressed in this issue. 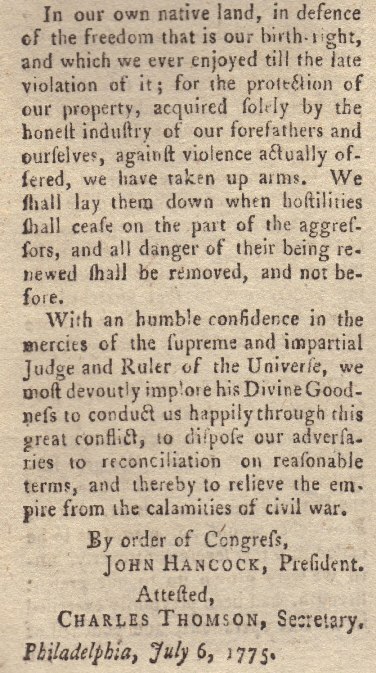 With the first report of George Washington appointed American Commander-in-Chief, the full text of the Declaration of the Causes of Taking Up Arms and the American account of the first full scale battle of the Revolutionary War, this is a rare and valuable piece of history to be treasured for a lifetime.